Terrorism did not start yesterday. Historically, Norfolk hotel was bombed in 1980, 20 killed, 80 injured. The US embassy bombed in 1998, 224 death counts, more than 4,000 non fatal injuries. 2011/2012, more than 17 attacks involving grenades and explosives, at least 48 dead, roughly 200 injured. Then the Westgate attack, death count: 62 civilians from different countries, 5 security officers, and ALLEGEDLY, the 4 terrorists. I watched it all with cut breath, sniveled with every gunshot and froze with all the images I saw, that was not Kenya! One year later, so many unanswered questions. No one held responsible, only blame game soaring like confetti from the NIS for failing to detect the attack, to the police for not reacting in time and the Kenyan military for mishandling the takeover. This was followed by The Mpeketoni mass killings, arson, van hijacking and mass shooting. Again, more than 60 people killed. They shot men, and forced women to watch. Every woman truly knows the pain of losing a child, a brother, a husband, a friend or a fiancé! Later, a newspaper reported that the police turned up ten hours after the first attack, yet they had received warning of the looming incursion before time. The assailants must have had a walk in the park burning hotels, restaurants and houses, maybe for the satisfying gift of 72 virgins later in paradise. Tomorrow, there will be celebrations, ‘cultural heritage festivities’. We will childishly watch some half dressed traditional dancers shaking their stiff bodies, listen to some budding spoken word masters struggling to be fluent but unable to conceal the local dialect influence, probably replacing R with L while talking of Kenya the paradise, and oh Kenya the land of milk and honey. Paradoxically trying to sound like the same Britons from whom we celebrate freedom. Some musicians are now rehearsing on the songs of victory they will present to the hungry crowd with rusted guitars and sharp voices. People will give stiff smiles to the cameras anticipating that they will appear on National TV…and later we will hear speeches that I do not want to think through, and of course, people will clap their hands in the hope of getting noticed and being rewarded heavily for taking time off their busy schedules to attend this ceremony and paying attention to the end! But I won’t, I WILL NOT CLAP. Until there is a sound security system in the country, until we all learn to look beyond religion and together work towards a peaceful cohesion, and understand that fighting for peace by blood and machetes is like making love to someone to prove that you are a virgin, until we know that peace is the undying individual commitment to respect the other and that what happens to the least of us affects us all as a nation, until such a day comes, I refuse to clap my hands in disdain. 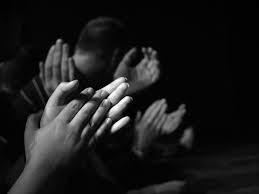 We are being blinded and tossed from one corner to the other with empty words…I refuse to clap too!